Advent is at our throats! Keep the season, but keep it simple. This year, there’s no time to recover from Thanksgiving before it’s time to dive into Advent. Luckily, the thing about celebrating Advent is that, by definition, you have to keep it simple. A lush, lavish, complicated Advent makes about as much sense as a simple, understated fireworks display on the Fourth of July. There are lots of wonderful ideas out there for how to observe the season, but it’s not only impossible to do it all, it would be contrary to the spirit of the season to go overboard! Score one for the busy, the lazy, the disorganized, the overwhelmed. We do two things without fail every Advent. If these are the only two things we do, I consider it a successful Advent. The first is to make and light an Advent wreath, which we attempt to light every night while singing “O Come, O Come Emmanuel” (adding two verses each week). Some years, we only manage to do it on Sundays or weekends. I just bought a cheapo twisted twig wreath at the dollar store, and I send the kids out to gather greenery from the yard. Use about forty yards of thread or wire and strap those suckers down. If I can’t find purple and pink candles, I just use white, and tie on bows made of ribbon or cloth in the right colors. Oh, and after a lifetime of trying to attach candle holders to a wreath, I just gave up, and now use (again, cheapo dollar store) glass candle holders, which I set inside the wreath. I put the whole thing on a pizza pan, so I can easily move it off the table and store it in a safe, unpunchable place when it’s not in direct use. Some years we have little golden balls and berries and doves, but other years, it’s just the greenery. Some people do paper Advent wreaths. I would be sad not to include actual flames and actual greenery (the evergreens remind us of everlasting life; the flames remind us of Christ, the light of the world); but for goodness’ sake, if you just had a baby, or if the idea of flames in the home makes you grind your teeth, do what makes sense for you. Here are prayers for each Sunday, and here are all the verses to “O Come Emmanuel.” Print them out and tape it to your pizza pan or something. The second thing we do for Advent is we all go to confession once or twice before Christmas. Here are various examinations of conscience for adults, kids, and others; “Confession” is a $1.99 app with a customizable examination of conscience; Mea Culpa is a free app; and here is a very good book which prepares kids for their first confession (and is a great way to brush up your own understanding of the sacrament.) And while we’re at it, this short, enormously encouraging essay about confession from a priest’s point of view deserves another read. That’s it: light the wreath, sing, go to confession. That’s the bare minimum, and some years, it’s also the maximum we can manage. There are plenty of wonderful Advent ideas. But please remember, KEEP IT SIMPLE. Don’t go overboard. Pick one or two, and don’t make it elaborate. And make sure you get to confession! If you want a hands-on project for your kids but aren’t feeling very crafty, here is a free printable chain from Life Made Lovely. (It’s designed for a different year, when Advent starts on Dec. 1, but if you’re like me, you can roll with these things. Just correct the dates and start a few days late, no big deal.) This particular one just has a short description and a Bible verse to look up and read, and is designed for little kids; but if you Google “advent chain 2015,” you will find other styles, some more elaborate that others. Print it out, cut the days into separate strips, and staple or tape them into a long chain. (If you like, you can print them on purple and pink paper, or tape the strips to colored paper.) You can hang the chain on your Christmas tree if you have one already, or anywhere in the house (hang it high, to avoid punching). Each day (or the night before each day. Look, I’m confused about the dates. You figure it out! ), you cut off one link each day and read what’s inside. You can also just make a plain paper chain out of strips of purple and pink paper, one link for each day of Advent, and clip off one link every day. The idea is that it helps the kids visualize how much of Advent is left, and they can see the chain getting shorter and shorter as Christmas approaches. Explain that it reminds us of the chains of sin, which get weaker and weaker until our Savior arrives — and then the chain is gone. Another option: Here is a printable Advent chain you can print out, designed by my sister, Abby Tardiff. These have complete short Bible verses on them, with little pictures to color. If you do do an advent chain that has pictures on it, you could also level up to a . . . Lacking space for a free-standing Jesse Tree, I just clip a branch from a bare tree and bolt it to the wall. It looks good and weird, like a Catholic home should. Some families have reusable Jesse Tree ornaments, but temporary ones are fine, too, and you can use the opened Advent chain strips as ornaments. Read the verse, have a kid color the picture, and hang it on the Jesse tree. Done. We have a tradition of making Jesse tree ornaments each year on the Friday after Thanksgiving. I find a list of ornament ideas (there is no official list! ), read them off, and the kids dibs them. There’s usually something for everyone, rainbows to daggers. 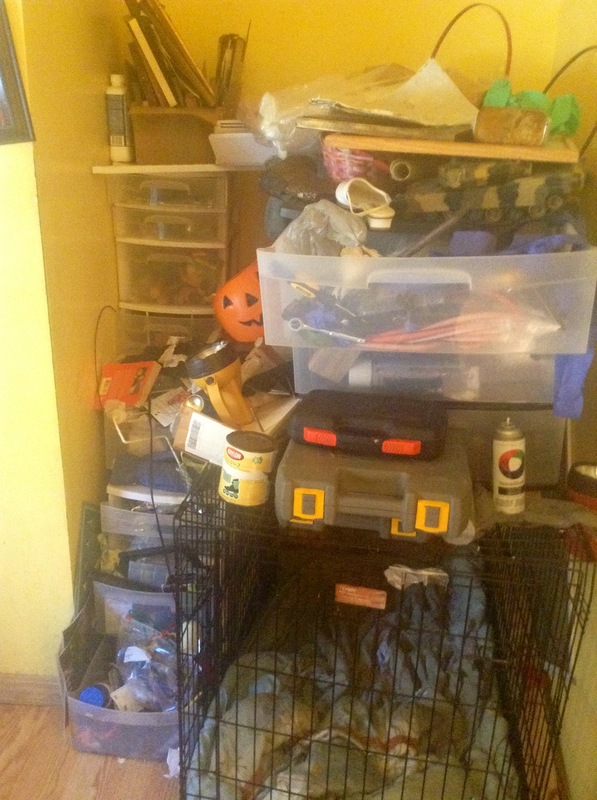 We dump all the craft materials which we have carefully kept organized and . . . sorted . . .
on the table, and the kids go to work while I go hide for a couple of hours, repeating the phrase “it’s only once a year” to myself, and with the firm understanding that glitter on the floor doesn’t count as a mess unless it actually impedes your walking. Some people keep Advent as a “little Lent” — not as stringent as actual Lent, but still a season of preparation and penance, as we anticipate Christmas day. I can’t hack this, at least not as a family. It’s too hard to do all the baking and shopping and decorating that really has to be done in December, and also practice self-denial and penance. If I manage to prepare for Christmas without making life miserable for the family, I’ll count that as a spiritual win. One thing we do manage is to “fast” from dessert on Saturdays (we only have dessert on the weekend) and use that money to buy an extra item for the Vincent de Paul food pantry. Don’t forget, poor people appreciate treats, too especially if they have kids. It’s very important to donate staples (dried milk, tuna, pasta), but consider adding a box of cookies, a few chocolate bars, or some spices. Non-essentials in the kitchen help poor people feel more human. What does Advent look like at your house? Traditions, great ideas, horrible disasters? Share ’em if you got ’em!